Ghosts and goblins are welcome at the Museum the week before Halloween. Join us for a frighteningly fun family evening filled with more treats than tricks. 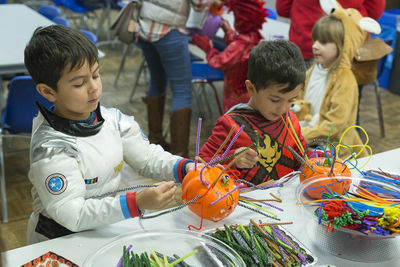 Enjoy festive art making, trick-or-treating in the galleries, a Halloween-themed dance party, and refreshments for all. Costumes are encouraged! This is a free program but tickets are required and are available online starting October 2. Free shuttle starting at 4:45 p.m. from Compton Family Ice Arena lot to Museum or park in visitors' lot south of Stadium and walk to Museum.